The Veterans of Foreign Wars held their annual state meeting earlier this month in Bangor and recognized the winning essays in both the Patriot’s Pen and Voice of Democracy annual contests. 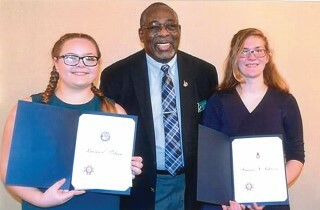 Pictured above are Windham VFW Post 10643 Commander Willie Goodman with Lauren DeLuca of Windham Middle School and Brianna Johnson from Windham Christian Academy. The VFW is proud that both Lauren and Brianna won at the local and district levels and each one was selected as the third-place winner for the state in their division. Lauren and Brianna were presented with certificates and checks at each level. Congratulation to Lauren and Brianna.